Thomas SKINNER III (1668 – 1757) was Alex’s 9th Great Grandfather, one of 1,024 in this generation of the Shaw line. Thomas Skinner was born 3 Nov 1668 in Malden, Mass. His parents were Thomas SKINNER II and Mary PRATT. He married Hannah CARPENTER No record has been found of Thomas Skinner and Hannah Carpenter’s marriage or intentions, at Malden or elsewhere. The 16 May 1694 marriage date appears occasionally online but is never accompanied by a source citation or any kind of support. The most responsible approximation is “by 1695,” based on the birth date, 30 May 1695, of their first child, Thomas. Thomas died 9 Jun 1757 in Norton, Mass. 1. 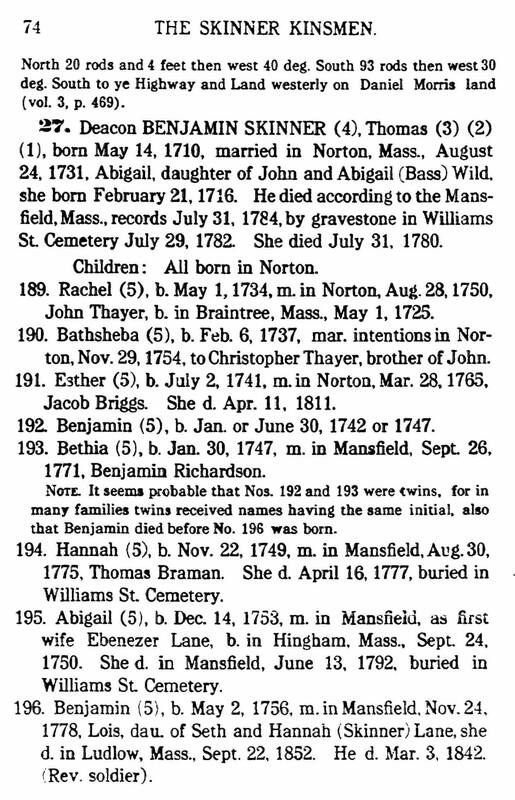 Thomas SKINNER IV 30 May 1695 in Wrentham, Mass Abigail DAY5 Jan 1719/20 Wrentham, Mass 17 Feb 1748/49 in Mansfield, Bristol, Mass. 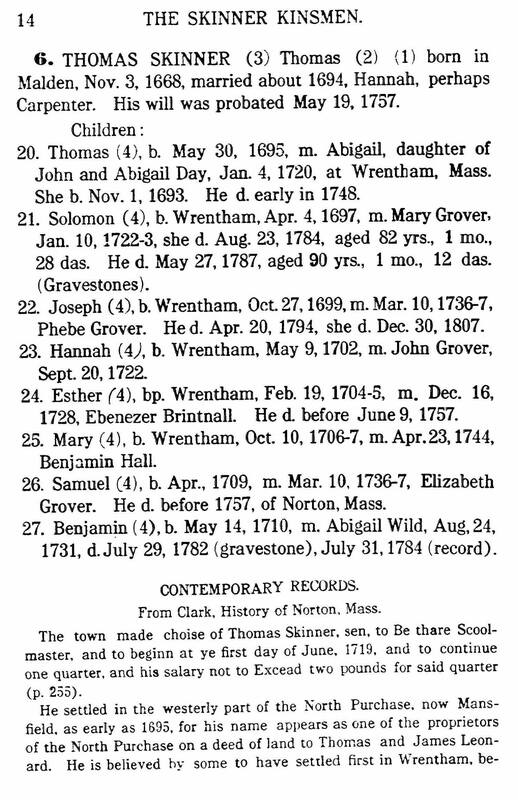 Some genealogists think that Thomas first settled at Wrentham because the births of his first children were recorded there, but others think that he just attended meetings at Wrentham because it was closer than Taunton to his homestead in Norton, later Mansfield. Today there is a Premium Outlet in Wrentham. Norton was first settled in 1669. Then called North Taunton for its location on the northern border of Taunton, Massachusetts, the town’s name was shortened to Norton upon its official establishment on March 17, 1710. Parts of Norton were originally established as Easton on December 21, 1725, and as Mansfield on April 26, 1770. 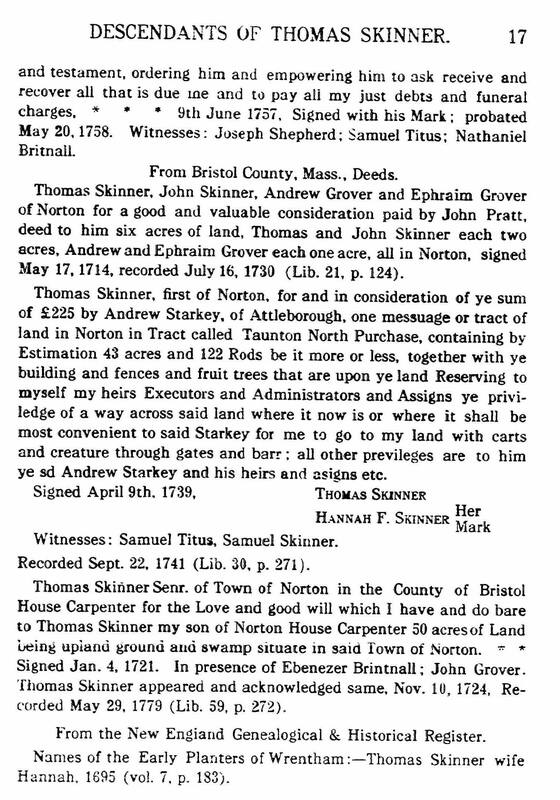 1 Jun 1719 – According to the History of Norton, Mass., “The town made choise of Thomas Skinner, sen, to Be thare Scoolmaster, and to beginn at ye first day of June, 1719, and to continue one quarter, and his salary not to Excead two pounds for said quarter. He settled in the westerly part of the North Purchase, now Mansfield, as early as 1695, for his name appears as one of the proprietors of the North Purchase on a deed of land to Thomas and James Leonard. He is believed by some to have settled first in Wrentham, because some of his children’s births are recorded there. He doubtless attended meeting at Wrentham, because it was much nearer than Taunton. He was one of the original members of our church, and the first schoolmaster of Norton. 1738 ; for, on the 25th of October of that year, ” The Inhabitance made Choice of Eleazer Eddy, the first, and Thomas Skinner, the Second, according to the Late act Relating [to] the Preservation of the Deare : ” and for several years thereafter, at the annual March meeting, two persons were chosen for that purpose. On the 16th of August, 1731, George Leonard, justice of the peace, issued a warrant, directed to Josiah Pratt, one of the inhabitants of the North Precinct of Norton, authorizing him to notify the inhabitants of the precinct to meet at the house of Isaac Wellman, “on Tuesday, the 31st of August,” to choose precinct officers. At this meeting, Nicholas White was chosen moderator; Benjamin Williams, clerk; John Skinner [Thomas’ brother]., Josiah Pratt, and Ephraim Leonard, assessors; Joseph Elliot, treasurer; Thomas Skinner, Nicholas White, and Ephrain Grover, prudential committee. During the winter of 1831-2, it is supposed, the precinct had stated preaching, in accordance with the vote passed Dec. 13. March 27, 1732, at a legal meeting of the precinct, it was “voted to give Rev. Mr. Ephraim Little, of Scituate, a call to settle with them in the work of the Gospel ministry;” aud they agreed to give him a yearly salary of a hundred pounds, old tenor, during his ministry in the precinct, and offer him, as a settlement, two hundred pounds, to be paid in annual instalments of fifty pounds. These proceedings were “without a negative vote.” Mr. Little, however, gave a “negative” auswer; no doubt, much to the disappointment of the precinct. We had prepared a full ecclesiastical history of the North Frecinct; but our crowded pages and other good reasons oblige us to omit most of it. Oct. 7, 1734, Abiel Howard, of Bridgewater, was unanimously chosen pastor. “He could not see his way clear to accept the call;” and hence the precinct try again. May 20, 1735, they unanimously gave a call to Atherton Wales, of Braintree; but he declined it. With commendable perseverance, the precinct, Dec. 20, 1735, unanimously invited Samuel Toby, of Sandwich, to settle. His answer was “No.” Again they look about for a candidate. One is procured. He is acceptable to the people, who, Sept. 7, 1736, ask Ebenczer White, of Brookline, to be their “gospel minister;” and, after about four weeks’ deliberation, he accepted the invitation. The ordination took place, Feb. 23, 1737; but who took part in the interesting services of consecrating him to tlie work of the gospel ministry is unknown, as no records are to be found. It is uncertain on what particular day tlie church was embodied. No record of the organization of the church, or the names of those who composed it, are extant among the church or parish papers; but Rev. Mr. Avery fortunately made in his church-records the following entry, which throws some light upon the matter. We therefore transcribe it. Mr. White’s ministry was not of the most peaceful character. He was probably too liberal in his views to satisfy many of the “stricter sort” of his parish. He was of a feeble constitution, and hence frequently was unable to attend to the duties of his office. Just as negotiations for his withdrawal from the ministry were completed, and a successor had been chosen, or on the 18th of January, 1761, he left the troubles of earth for the peaceful realms of the spirit-world. 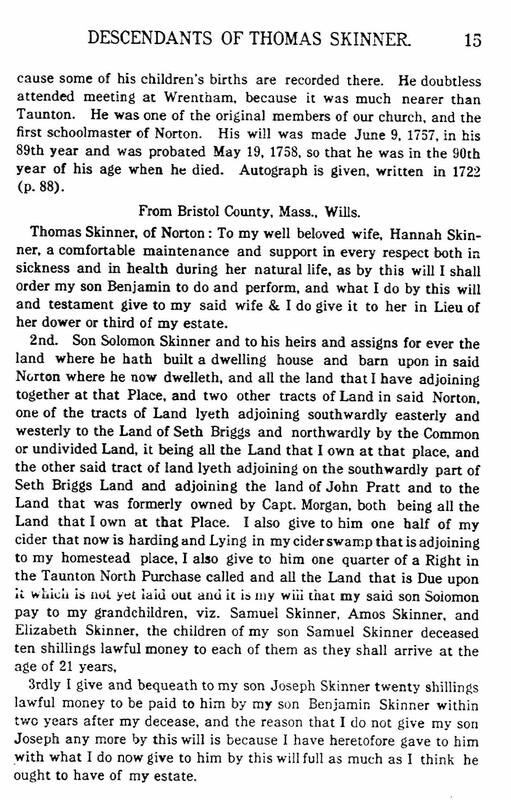 “Thomas Skinner, of Norton: To my well beloved wife, Hannah Skinner, a comfortable maintenance and support in every respect both in sickness and in health during her natural life, as by this will I shall order my son Benjamin to do and perform, and what I do by this will and testament give to my said wife & I do give it to her in Lieu of her dower or third of my estate. 2nd. Son Solomon Skinner and to his heirs and assigns for ever the land where he hath built a dwelling house and barn upon in said Norton where he now dwelleth, and all the land that I have adjoining together at that Place, and two other tracts of Land in said Norton, one of the tracts of Land lyeth adjoining southwardly easterly and westerly to the Land of Seth Briggs and northwardly by the Common or undivided Land, it being all the Land that I own at that place, and the other said tract of land lyeth adjoining on the southwardly part of Seth Briggs Land and adjoining the land of John Pratt and to the Land that was formerly owned by Capt. Morgan, both being all the Land that I own at that Place. I also give to him one half of my cider that now is harding and Lying in my cider swamp that is adjoining to my homestead place, I also give to him one quarter of a Right in the Taunton North Purchase called and all the Land that is Due upon it which is not yet laid out and it is my will that my said son Solomon pay to my grandchildren, viz. Samuel Skinner, Amos Skinner, and Elizabeth Skinner, the children of my son Samuel Skinner deceased ten shillings lawful money to each of them as they shall arrive at the age of 21 years. 3rdly I give and bequeath to my son Joseph Skinner twenty shillings lawful money to be paid to him by my son Benjamin Skinner within two years after my decease, and the reason that I do not give my son Joseph any more by this will is because I have heretofore gave to him with what I do now give to him by this will full as much as I think he ought to have of my estate. 4th, I give and bequeath unto my son Benjamin Skinner and to his heirs and assigns forever my dwelling House and Barn and all my Land in said Norton where I am living, and all the Land that I have adjoining to it, and two acres of Meadow in said Norton be it more or Less adjoining southwardly upon Wading River and southerly upon land that is owned by the Heirs of John Brintnall, Deceased, and westwardly on the Common and undivided Land, and Northwardly on the Land that does belong to the heirs of John Watson Esq., Deceased, and about nine or ten acres of land in said Norton be the same more or less adjoining Northwardly in the Old Colony line, so called, and bounded westerly on the Land of Nathaniel Brintnall, and southwardly by the Land of David Hardon, and easterly partly on the land of said Hardon and partly on the Land of Deacon William Dean. 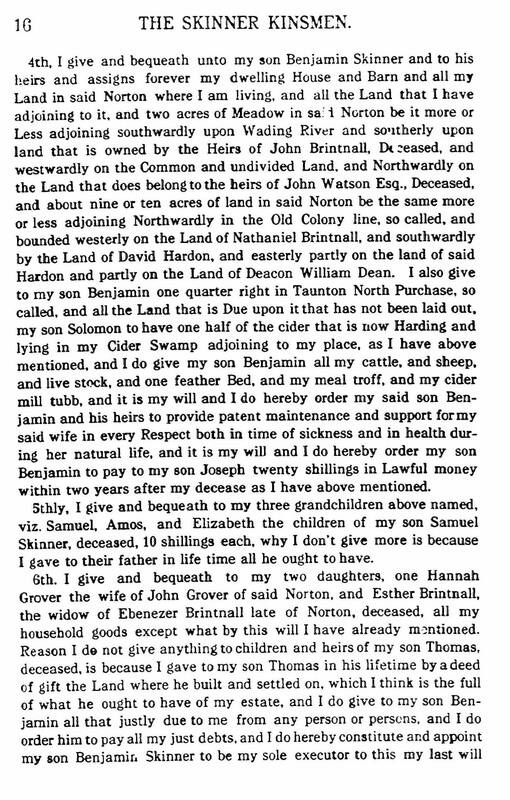 I also give to my son Benjamin one quarter right in Taunton North Purchase, so called, and all the Land that is Due upon it that has not been laid out, my son Solomon to have one half of the cider that is now Harding and lying in my Cider Swamp adjoining to my place, as I have above mentioned, and I do give my son Benjamin all my cattle, and sheep, and live stock, and one feather Bed, and my meal troff, and my cider mill tubb, and it is my will and I do hereby order my said son Benjamin and his heirs to provide patent maintenance and support for my said wife in every Respect both in time of sickness and in health during her natural life, and it is my will and I do hereby order my son Benjamin to pay to my son Joseph twenty shillings in Lawful money within two years after my decease as I have above mentioned. 5thly, I give and bequeath to my three grandchildren above named, viz. Samuel, Amos, and Elizabeth the children of my son Samuel Skinner, deceased, 10 shillings each, why I don’t give more is because I gave to their father in life time all he ought to have. 6th. I give and bequeath to my two daughters, one Hannah Grover the wife of John Grover of said Norton, and Esther Brintnall, the widow of Ebenezer Brintnall late of Norton, deceased, all my household goods except what by this will I have already mentioned. Reason I do not give anything to children and heirs of my son Thomas, deceased, is because I gave to my son Thomas in his lifetime by a deed of gift the Land where he built and settled on, which I think is the full of what he ought to have of my estate, and I do give to my son Benjamin all that justly due to me from any person or persons, and I do order him to pay all my just debts, and I do hereby constitute and appoint my son Benjamin Skinner to be my sole executor to this my last will and testament, ordering him and empowering him to ask receive and recover all that is due me and to pay all my just debts and funeral charges. 9th June 1757, Signed with his Mark; probated May 20,1758. Witnesses: Joseph Shepherd; Samuel Titus; Nathaniel Britnall. “ Thomas Skinner Senr. of Town of Norton in the County of Bristol House Carpenter for the Love and good will which I have and do bare to Thomas Skinner my son of Norton House Carpenter 50 acres of Land being upland ground and swamp situate in said Town of Norton. Signed Jan. 4, 1721. In presence of Ebenezer Brintnall; John Grover. 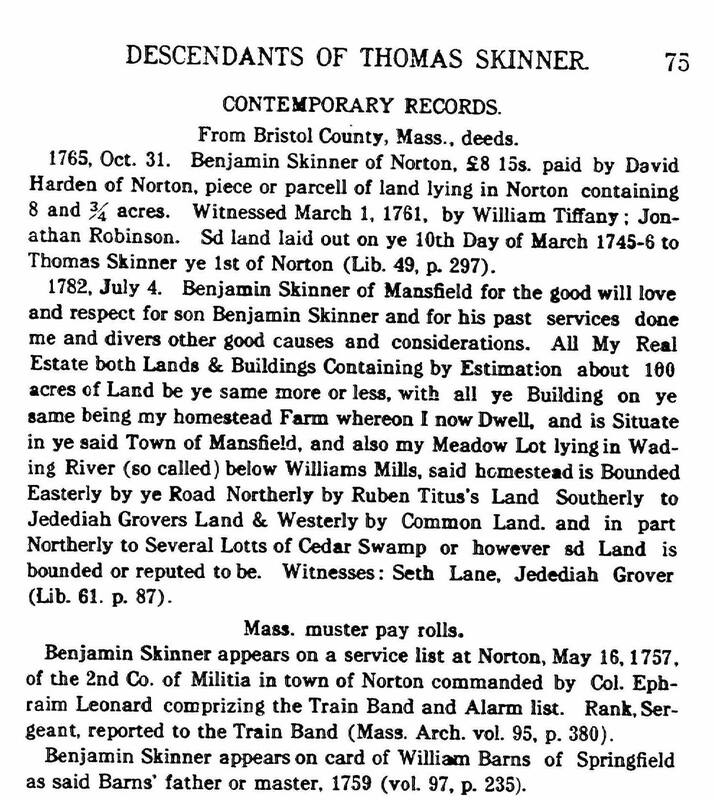 Thomas Skinner appeared and acknowledged same, Nov. 10, 1724, Recorded May 29, 1779. Thomas Skinner, the son of Thomas and Mary (?) 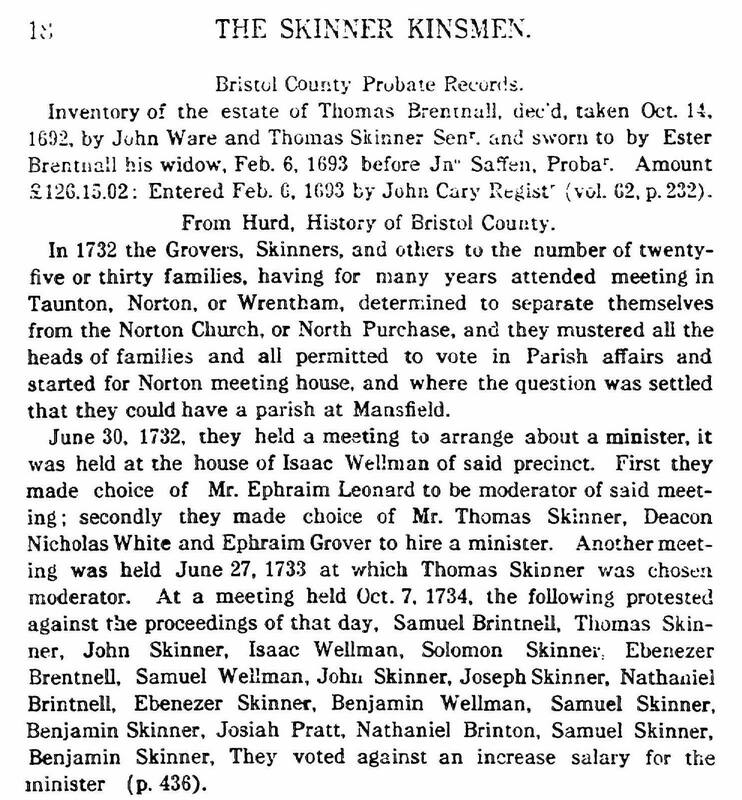 Skinner, and grandson of Thomas, who came from Chichester, England, about 1650, and settled in Maiden, was born November, 1668. He settled in the westerly part of the North Purchase, now Mansfield, as early as 1695; for his name appears as one of the proprietors of the North Purchase on a deed of land to Thomas and James Leonard, already mentioned. He is believed by some to have settled first in Wrentham, because some of his children’s births are recorded there. He doubtless attended meeting at Wrentham, because it was much nearer than Taunton? but I am confident that he did not reside there. He was one of the original members of our church, and the first schoolmaster of Norton. He married Hannah Carpenter (?) about 1694, and had eight children. His will was made June 9, 1757, in his eighty-ninth year; and was probated May 19, 1750: so that he was in the ninetieth year of his age when he died. We here give his autograph, written in 1722. John Skinner was a brother, or perhaps only halfbrother, of Thomas: for Mary, the wife of Thomas Skinner, died at Malden, April 9,1671; and John was born April, 1673. He settled in the west part of the North Purchase about the time Thomas did; was a proprietor, and his name is attached to the deed of the proprietors to the Leonards. He was a member of our church at its organization. His wife’s name was Sarah , married about 1696; and they had seven children. He was living in 1738; but when he died is uncertain. 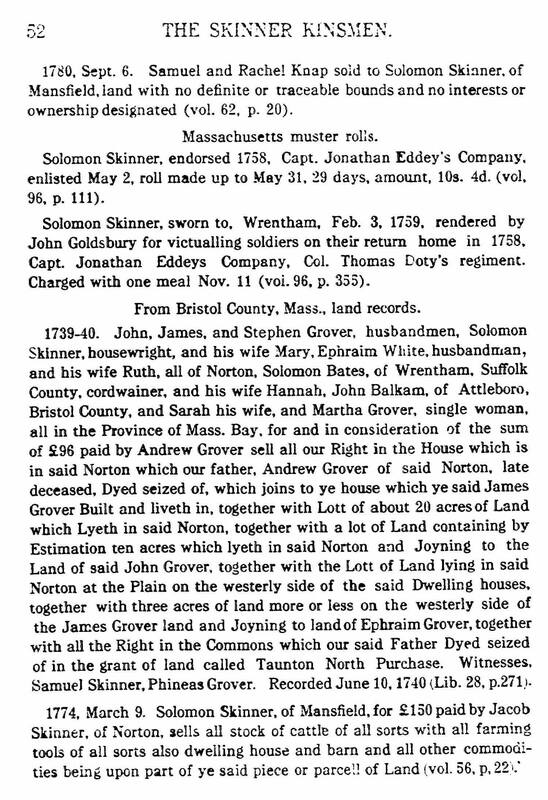 There was a John Skinner who died at Wrentham, April 8, 1754; and he might have been the man. His autograph was written in 1695. Solomon’s wife Mary Grover was born 26 Sep 1701 in Malden, Middlesex, Mass. Her parents were Andrew Grover and Mary Freety. Mary died 23 Aug 1784 in Mansfield, Bristol, Mass. Andrew Grover, the brother of Thomas, was born October, 1673. His wife’s name was Mary , married about 1697 ; and they had three children born at Maiden, before removing to Norton, and seven afterwards. He is supposed to have died about 1751. Joseph’s wife Phebe Grover was born 10 Mar 1710 in Wrenthan, Mass. Her parents were Thomas Grover and Mary Cox. Phebe died 30 Dec 1807. Thomas Grover was the son of Thomas and Sarah Chadwick of Maiden, and was born, according to records, March, 1668 (1669 ?). He settled near what is now West Mansfield. He and his brothers, Andrew and Ephraim, bought land in company, Nov. 14, 1702 ; and built their houses some forty or fifty rods apart, forming a sort of equilateral triangle. Thomas’s house was where John T. Tobit now lives, on the road leading to the Christian Chapel. Andrew’s house was where Rev. N. S. Chadwick now lives, on the road leading to Mansfield Centre ; and Ephraim’s house was on the road now leading to the Depot, at West Mansfield. Thomas married, July 29, 1697, Mary Cox ; and had three children born at Maiden, and three others at Norton. Hannah’s husband John Grover was born 12 Mar 1697 – Middlesex, Mass. His parents were Andrew Grover and Mary Freety. John died 27 Mar 1785 in Malden, Middlesex, Mass. Esther’s husband Ebenezer Brintnall was born 1700 in Wrentham, Norfolk, Mass. His parents were Captain Samuel Brintnall and Esther Carpenter. Ebenezer died 9 Jun 1757. 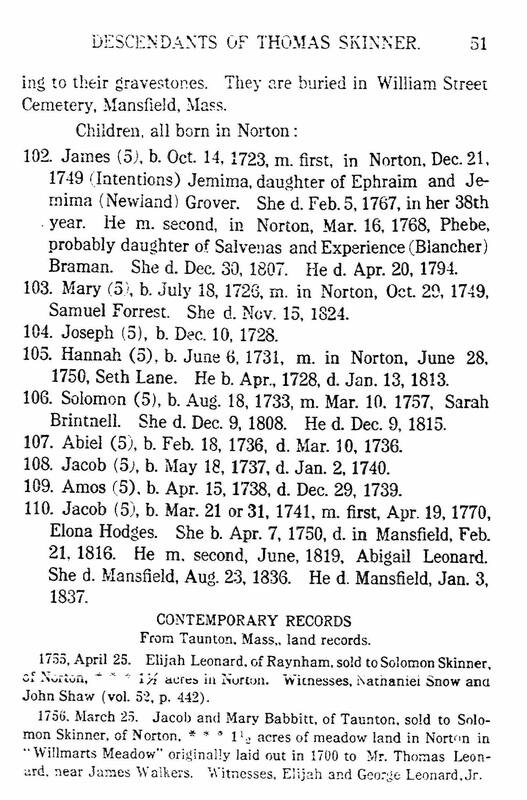 Samuel’s wife Elizabeth Grover was born 31 Oct 1708 in Wrenham, Norfork, Mass. Her parents were Thomas Grover and Mary Cox. Benjamin’s wife Abigail Wild was born 21 Feb 1716 in Norton, Bristol, Mass. Her parents were John Wild and Abigail Bass. Abigail died 31 Jul 1780 in Mansfield, Bristol, Mass. This entry was posted in 11th Generation, 90+, Line - Shaw and tagged Malden, Norton. Bookmark the permalink. The link above to http://members.cox.net/jrcrin001/Joseph3-Rehoboth&Swansea.pdf is obsolete. The targeted article—important for providing circumstantial evidence that Thomas Skinner III’s wife, Hannah, was the daughter of Joseph3 and Margaret (Sutton) Carpenter—is now at http://carpentercousins.com/Joseph3_Rehoboth&Swansea.pdf.